2018 CSA — Rustle floral co.
WHAT IS THE FLOWER SHARE? Our community-supported flowers are based on the community supported agriculture (CSA) model. Similar to a vegetable CSA, members sign up and pay in advance for a share of the season’s harvest. Your early payment allows us to make plans, and purchase seeds and supplies in the off-season. In return, you receive a share of our beautiful seasonal harvests. AFTER MANY REQUESTS, WE ARE GOING TO BE OFFERING A LIMITED AMOUNT OF SPRING BOUQUET SHARES. IT WILL RUN FOR 4 WEEKS, AND WILL BEGIN WHEN MOTHER NATURE INTENDS IT TO! WE NEVER KNOW WHAT KIND OF WINTER OR SPRING WE WILL BE GETTING IN NEW ENGLAND, SO OUR ONLY OPTION IS TO WAIT AND SEE! AS YOU ALL KNOW, SPRING WILL SHOW IT’S FACE EVENTUALLY. WE WILL BE ABLE TO GIVE A 2 WEEK NOTICE BEFORE THE SHARE BEGINS BY EMAIL. OUR BEST ESTIMATE IS MID TO LATE APRIL THROUGH MID TO LATE MAY. THIS FALL WE PLANTED HUNDREDS OF SPECIALTY TULIPS, DAFFODILS, JAPANESE ANEMONE, ITALIAN RANUNCULUS, MUSCARI, HYACINTH AND SPECIALTY ALLIUMS, AND WE CAN’T WAIT TO SHARE THEM WITH YOU! 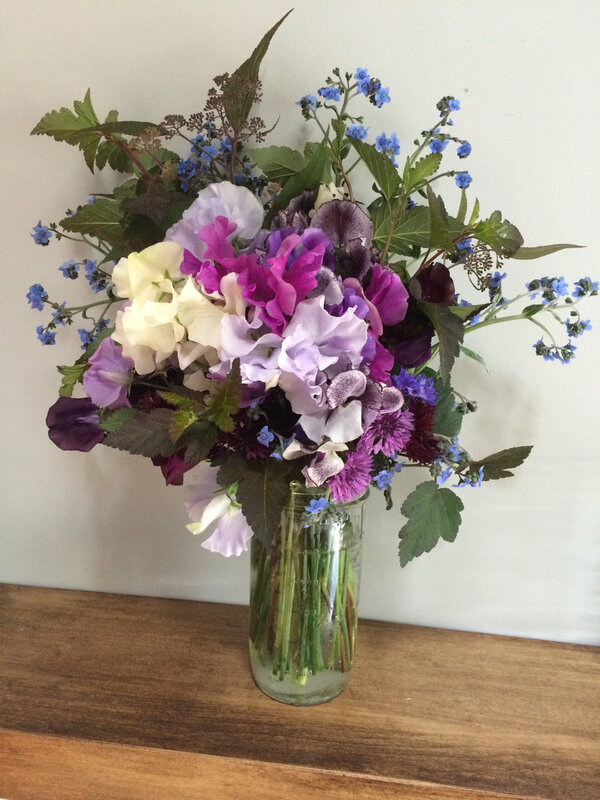 COMBINED WITH FORAGED SPRING GREENERY, THEY WILL BE SURE TO BRIGHTEN YOUR SPRING RIGHT WHEN YOU NEED IT THE MOST! BOUQUETS MAY BE TALL, SHORT, FULL, AIRY, AND UNIQUE. IT ALL DEPENDS ON WHAT IS BLOOMING AND THE BEST WAY TO DESIGN WITH IT FOR YOU. SOLD OUT! summer shares are still available. Only 15 shares being offered! Enjoy a handmade mixed-flower bouquet each week for your kitchen table, workspace, or gifting. Bouquets are specially created for members with our fresh picked flowers including many fragrant, unusual, and heirloom varieties. Your bouquet will be wrapped and waiting for you at your choice of pick-up location. Simply give the stems a fresh cut before placing into your favorite vase. If you’re feeling inspired and like to create your own designs, our bulk flower share is meant for you! Receive a bucket of blooms each week with enough flowers and accent foliage to create your own floral creations. Share the bucket with a friend and have a weekly bouquet-making gathering! It’s a great way to spend time with friends, children, and loved ones. It is also an economical way for small businesses and restaurants to display seasonal flowers. Plan on two large bouquets or a few smaller bouquets, and have a little left over for bud vases. Know a fellow flower lover? Our shares make great gifts for family, friends and colleagues. Send someone special this unique gift that can be enjoyed for weeks to come. GET WEEKLY FLOWERS DELIVERED TO YOUR OFFICE! IF YOU WOULD LIKE TO INTRODUCE A DROP OFF LOCATION AT YOUR WORKPLACE, GET TOGETHER WITH 8 OR MORE FRIENDS AND START A NEW TREND! BRIGHTEN UP A DARK CUBICLE WITH WEEKLY SUMMER BLOOMS. EMAIL KATELYN AT RUSTLEFLORALCO@GMAIL.COM TO REQUEST A SPECIAL DELIVERY! In order to make local flowers affordable, we offer the option to pay for shares in two separate installments. Your first payment due at sign-up is 50% of the total. The balance can then be paid at your convenience on or before June 1st. Please contact us if you would like to set up a payment plan. Our flowers are grown, harvested and handled to provide the longest vase life possible. Simply give stems a fresh cut at an angle with sharp scissors and remove any leaves that will be below the water line. Place in a clean vase of fresh cool water. A floral preservative can be added if desired. Freshen the water every 1-2 days. Display your blooms away from heat and direct sunlight and away from ripening produce (like bananas). A clean vase is imperative for longevity.